CCTX Bronze Star Exterior Construction Star Drive Lag Screws 1" to 16" - Star Drive Wood Screws - Screw Products, Inc.Star Drive Wood Screws – Screw Products, Inc. The Ultimate AC257 Compliant Lag Screw! Our AC257 Compliant Construction lag screws are stronger and more durable than ordinary lag screws! The built-on round washer gives a neat, finished appearance. Triple coating shown over 1200 hours of corrosion resistance in ACQ and salt spray conditions. Compatible with pressure treated lumber & can be used with tannic wood such as Cedar and Redwood. Deep cutting threads allow driving ease! Great for ledger boards, heavy timber construction, insulation panels, pole to post and more! CCTX- Bronze Star 3/8" Exterior Star Drive Lag Screws 4" to 16"
AC257 Compliant Coating, Round washer head, 11/16" head dia. on 3/8" nominal lags. Extra Sharp Point with Type 17 Auger Point, Knurl on Shank, deep sharp threads, spiral cut thread, hardened steel, coated. CCTX - Bronze Star 5/16" Exterior Star Drive Lag Screws 2-1/2" to 6"
Round washer head, 5/8" head dia. on 5/16" nominal lags. AC257 Compliant Coating Extra Sharp Point with Type 17 Auger Point, Knurl on Shank, deep sharp threads, spiral cut thread, hardened steel, coated. CCTX - Bronze Star Exterior 1/4" x Star Drive Lag Screws 1" to 6"
Features AC257 Compliant Coating, Round Washer Head, Extra Sharp Type 17 Auger Point, Knurl on Shank, Deep Sharp Spiral, Hardened Steel. Available in 100ct & Bulk Cartons. CCTX - Bronze Star Exterior Star Drive Modified Truss Head Screws 1-1/4" to 2-1/2"
(2-1/2" Shown) Features AC257 Compliant Coating, Extra Sharp Type 17 Auger Point, Washer Head, Deep - Wide, Sharp Threads, Hardened Steel. 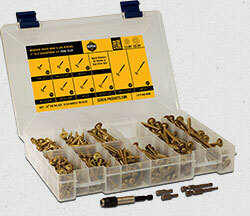 (CLCK Shown) This economical and compact assortment kit is the perfect accessory for your home, garage or workshop. Fully loaded, this take-anywhere kit is easy enough to carry & slim enough to fit just about any place you need. 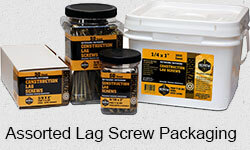 The ultimate coated for exterior use screws! Bonus! We’ll throw in 1 each of the following drive bits! : T25x1" - T15x1" - T25x2" - T15x2"